Domestic marine fisheries in Oman are increasingly viewed as the eventual economic alternative to the soon to be depleted oil reserves. This has galvanized the Omani government to invest in the management of its marine living resources. This study aims to provide a better estimation of Oman's domestic marine fisheries catches that can be used to improve fisheries management in the country. Using the catch reconstruction approach, total domestic marine fisheries catches by Oman are estimated for the time period 1950-2015, including reported and previously unreported large-scale and small-scale commercial catches, subsistence, and recreational catches, as well as major discards. Catches from the Omani exclave, Musandam, are estimated separately, given this governorate's geographical separation from the rest of Oman. Reconstructed total catches increased from around 64,000 t·year−1 in the 1950s to over 200,000 t·year−1 in the 2000s, which are overall 1.2 times the landings reported by the FAO on behalf of Oman. Fish stocks need to be sustainably managed to allow long-term economic viability. This cannot be done without the improvement of fisheries statistical systems around the world, including in Oman. Growing fisheries have intensively exploited fish stocks since the 1950s, leading to global overfishing and to worldwide resource depletions (Pauly et al., 2002, 2005; Watson et al., 2013). This has severely impacted the economies and societies of maritime countries around the world, particularly in the coastal countries of the developing world (Pauly et al., 2005; Béné, 2006; Swartz et al., 2010). In many of these countries, small-scale fisheries are particularly suffering from competition with industrial fisheries (Allison, 2001). Given the importance of these fisheries in providing food security and livelihoods to numerous coastal communities (Pauly and Zeller, 2014; Golden et al., 2016), proper management is required. The Food and Agriculture Organization of the United Nations (FAO) has been reporting “official” fisheries catches by country since 1950. In many countries, this is the only available information on marine living resources (Froese et al., 2012; Pauly and Zeller, 2016). Given that most methods to assess the status of fish stocks require substantial and costly data (e.g., fisheries independent surveys etc. 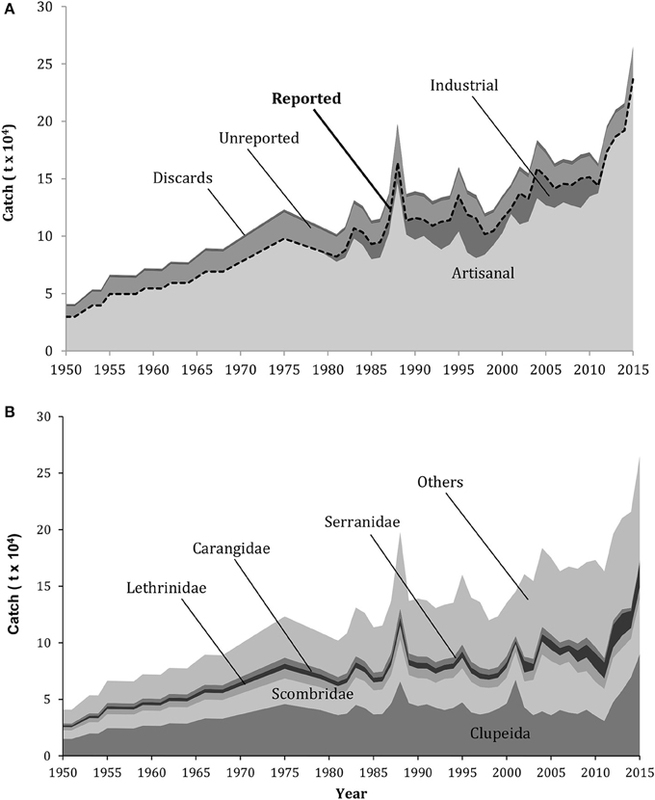 ), fisheries catch data remain, in many cases, the only basis for fisheries management (Worm et al., 2009; Costello et al., 2012; Pauly et al., 2013). Despite the importance of these data (Pauly et al., 2013), fisheries catch data reported by countries to the FAO are often heavily focused on commercial sectors only. FAO data requests specifically exclude discards, while data for most small-scale sectors (i.e., artisanal, subsistence and recreational) are often missing or substantially under-represented (Pauly and Zeller, 2016). The fact that global FAO data do not even differentiate between large- and small-scale catches (Pauly and Charles, 2015) makes proper evaluations of sectoral importance and affiliated management actions even harder to derive (Pauly and Zeller, 2016). By (re-)evaluating official and unofficial marine fisheries components, the catch reconstruction approach (Zeller et al., 2007, 2015) can provide a more comprehensive, and likely realistic picture of what is being withdrawn from world oceans. These components involve catches from the large-scale (industrial) and small-scale (artisanal, subsistence, and recreational) sectors, plus major discards (Pauly and Zeller, 2016). These catch estimates may be approximate, and with higher uncertainty than reported data, but they are better than assigning a value of zero catch to unmonitored fishing sectors (Pauly and Zeller, 2016). This study aims to provide a better estimation of the Sultanate of Oman's domestic marine fisheries catches that can be used to improve fisheries management in the country. Oman is an Arab country situated in the south east of the Arabian Peninsula, with a land area of around 300,000 km2, a continental shelf area of 54,000 km2 and an Exclusive Economic Zone (EEZ) of 536,000 km2 (www.seaaroundus.org; Figure 1). Because of its separation from the rest of the Arabian Peninsula by the Rub al Khali, i.e., the largest sand desert in the world, Oman's main connections with the rest of the world were via the ocean (Metz, 1993; Vincent, 2008). Musandam, one of Oman's governorates, is an exclave surrounded by the United Arab Emirates (Figure 1B). This governorate itself contains an exclave in the UAE, called Madha (75 km2), which amazingly contains an even smaller exclave of the UAE, called Nahwah. Figure 1. (A) Oman (excluding Musandam), its shelf (to 200 m depth) and Exclusive Economic Zone (EEZ). (B) The Musandam Peninsula (Oman), its shelf (to 200 m depth) and Exclusive Economic Zone (EEZ). Before the discovery of oil in 1962, the economy of Oman was based mainly on agriculture and fisheries, which represented 70% of the GPD (Metz, 1993). Until the mid-1980s, the economy of the country experienced a rapid expansion, with the oil industry accounting for 59% of GDP in 1985 (Metz, 1993). A drop in oil prices slowed down this expansion between 1986 and 1989, but prices increased again in the 1990s (Metz, 1993). During the pre-oil period, and due to relatively abundant fisheries resources (Strømme, 1986), the fishing sector was the second largest contributor to the economy, after farming (Riphenburg, 1998). However, with the expansion of the oil industry, fishers started leaving their boats for a more remunerative activity (Metz, 1993). Thus, in the early 1970s, the Omani government started developing and organizing the fishing sector by establishing the Fisheries Department followed by the creation of the Ministry of Agriculture and Fisheries, or MAF (Alhabsi et al., 2011); in 1978, it started subsidizing the fisheries, via a “Fishermen's Encouragement Fund” to increase employment in the fishing industry (Metz, 1993; FAO, 2001). During the 1990s, the Omani government decided to invest even more in potentially sustainable sectors, and thus funded several fisheries development and research projects, e.g., the Oman Fisheries Development and Management Project (Metz, 1993). In 2007, the Ministry of Fisheries Wealth was formed (Alhabsi et al., 2011). Until the 1980s, the Omani fishing industry was only small-scale in nature. In the 1980s, an industrial fishery was launched, following the signing of fishing agreements between Oman and other countries. In 1989, Oman ratified the UN Convention on the Law of the Sea (Morgan, 2006). “Catches” are defined as the sum of “landings” (i.e., retained and landed catch) plus “discarded” catch. Available data for total landings are assembled by taxon and year, for the period 1950-2015. Although, the national Omani fishery data and the reported FAO data for Oman have an overall similar trend, the taxonomic disaggregation in the national reports is more detailed. Therefore, national data are used as the baseline for the years 1985-2015 and data from the FAO's Fishstat database are used for the years 1950-1984, as data from Oman were unavailable. To this baseline dataset, we added estimates of previously unreported commercial large- and small-scale, recreational, and subsistence landings, as well as major discards, as obtained from independent and government studies, as well as the gray literature; throughout, we followed the general catch reconstruction approach outlined in Zeller et al. (2007, 2015). Catches were reconstructed for the whole country, then for the Musandam Governorate separately. Estimates of the catches of the sectors mentioned were then obtained for the rest of the country by subtraction. A taxonomic disaggregation is then performed for both spatial datasets, i.e., Musandam and the rest of Oman. From 1980 to 2010, two commercial fisheries sectors co-existed in Oman: artisanal/coastal (or “traditional”) and industrial (FAO, 2001; Alhabsi et al., 2011; Fisheries Statistic Department of Oman, 2016). In 2011, the artisanal/coastal fishing was split into two components for statistical reporting, i.e., “artisanal fishing” and “coastal fishing” (Fisheries Statistic Department of Oman, 2016). However, in the present reconstruction, we considered reported artisanal (i.e., small-scale) catches as the sum of coastal and artisanal reported catches. Thus, reported commercial catches are assigned to either the large-scale commercial sector (i.e., industrial) or the small-scale commercial sector (i.e., artisanal/coastal). The fishing industry in Oman is predominantly artisanal/coastal, and few regulations control the activities of this sector (Morgan, 2006; Anon, 2015). Table 1 shows different types of vessels making up the artisanal/coastal fleet. Fiberglass boats are the most common, i.e., 93% of artisanal vessels in 2010 (Alhabsi et al., 2011; Fisheries Statistic Department of Oman, 2016). Dhows are mainly used in the governorate of Alsharqiah, i.e., in the eastern part of Oman, and Shashas in the governorate of Albatinah, in the northeast (Alhabsi et al., 2011). A mixture of predominantly passive fishing gears are used, including hand lines, traps, and gill nets, etc., depending on the target species and season (FAO, 2001). The industrial fishery, initially foreign, became partly owned by Omani companies (Morgan, 2006; Fisheries Statistic Department of Oman, 2016). Industrial vessels are limited by a quota, are constrained to operate within certain areas of the EEZ (e.g., demersal trawlers had to operate at least 10 nm off the coast and at a minimum depth of 50 m), and are under satellite surveillance (i.e., vessel monitoring system) (Morgan, 2006). Industrial vessels in Oman used to be of 2 types: demersal trawlers and pelagic longliners. However, trawlers were banned in 2011, and as of this writing, only longliners are permitted, targeting large pelagic fishes at least 20 nm off the coast (Fisheries Statistic Department of Oman, 2012). Table 1. Characteristics of Omani artisanal/coastal fishing vessels. National data sources, from 1985 to 2015, reported commercial catches by sectors (Fisheries Statistic Department of Oman, 2016). Reported landings are considered 100% artisanal from 1950 to 1979, as the industrial fishery only began in 1980 (Morgan, 2006). In order to fill the gap for the 1980-1985 time period, proportions were interpolated, assuming zero industrial catches in 1979. Large-scale landings were reported by the Omani authorities separately for trawlers and longliners for the period 1985-2015 (Fisheries Statistic Department of Oman, 2016). We assign the industrial catches to either trawlers or longliners for the period 1980-1984 by extrapolating their ratios to 1980. Both the FAO and the national catch statistics suggest that there was a sudden and very steep increase toward a peak in reported catches in 1975, followed by a decrease in the late 1970s and early 1980s. While a distinct increase in landings in the mid-late 1970s may have been real, the magnitudes in these numbers around 1975 seem artificial. Given that during the 1970s, the Omani government invested in increasing fishing effort and developing the fishing industry (Alhabsi et al., 2011), we made a simplifying assumption that part of this peak in 1975 resulted from incidentally over-estimated official catches. This over-reporting would likely have been corrected with the establishment of the research program of the new Marine Science and Fisheries Center (MSFC) in the early 1980s (Alhabsi et al., 2011). Thus, to de-emphasize the likely artificiality of the high 1975 peak, we halved the value of this peak for 1975 and interpolated the reported data for the intervening years, i.e., interpolations between 1968 and 1975, and 1975 and 1981. Oman supports the FAO's efforts to combat Illegal, Unreported, and Unregulated (IUU) fishing, e.g., by monitoring access to the ports and employs the Omani Air Force, Navy, and Coast Guard to monitor for illegal activities (Dr. Hamed Said Al-Oufi, interview in www.theworldfolio.com, 2012). Issues that are being addressed are prohibited gears, fishing and exporting unauthorized species, and using unlicensed fishing boats (FAO, 2009). Nonetheless, given the isolated rural character of most non artisanal fishing communities in Oman, it is difficult for the authorities to monitor and control fishing activities around the country (Morgan, 2006). Furthermore, 66% of small-scale fishers are unlicensed (Belwal et al., 2015). Based on this, we assumed that unreported small-scale commercial catches decreased from the equivalent of 30% of reported artisanal catches in 1950 to 10% in 2015. These percentages were applied to the reported small-scale catches, except for catches of spiny lobster, as these were estimated separately. According to Morgan (2006) unreported catches of spiny lobster were estimated to be three times the official reported landings. 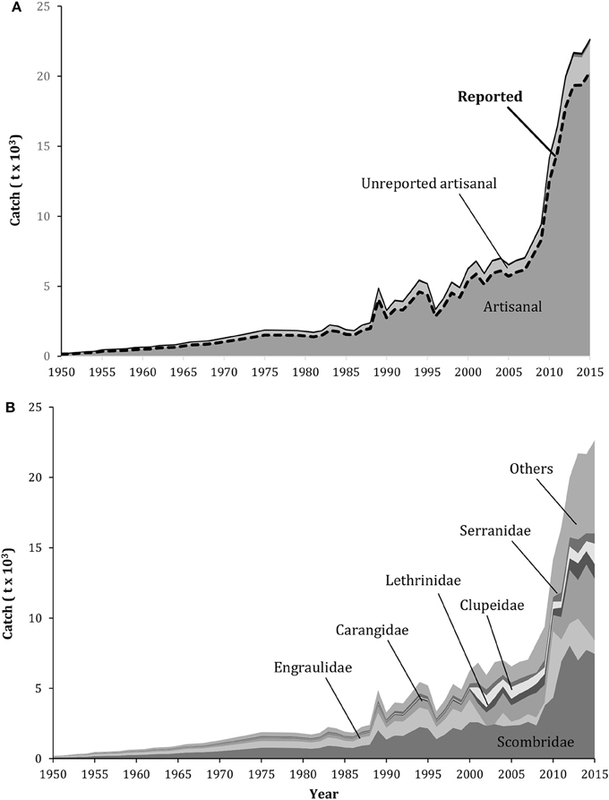 Hence, artisanal catches of spiny lobster were obtained by multiplying the reported catches of spiny lobster between 1950 and 2015 by a factor of 3. The industrial fishery is smaller (in terms of number of vessels and fishers) and more regulated and monitored than the small-scale commercial fishery, i.e., through quotas, gear control, and fishing area restrictions. Officers are deployed on almost every vessel to monitor its activities (Morgan, 2006). To broadly approximate potential unreported catches by the industrial fleet in Oman, we applied a percentage of 10%—which is equivalent to the 2015 artisanal unreported catch rate - to the reported catches of trawlers and longliners for the period 1980-2015. A subsistence fishery involves people who fish mainly for their personal and family consumption rather than primarily for commercial purposes. Until the 1970s, most of the Omani population was dependent on agriculture or fishing. The discovery of oil during the 1960s introduced an alternative source of livelihood. Thus, during the 1970s, numerous subsistence fishers left the fishing industry for other work opportunities (Dr. Hamed Said Al-Oufi, interview in www.theworldfolio.com, 2012). Our estimates of subsistence fishery catches are based on the rural coastal population of Oman, defined as people living within a 5 km range from the coast in rural areas (Table 5) and without easy access to urban markets. This information was available from the Socioeconomic Data and Applications Center for the years 1990, 2000, and 2010 (CIESIN, 2012). For the periods 1990-2000 and 2000-2010, data were interpolated. Information on the percentage of the rural population compared to the total Omani population, for the 1960-2014 period was available through the World Bank (data.worldbank.org). In 1960 and 1990, the rural Omani population comprised around 84 and 34% of the total population, respectively. Using this information and the percentage of the coastal rural population of 1990, i.e., 2.8% (Table 4), we could estimate the percentage of the coastal rural population for 1960, which was almost 7%. This percentage was then applied to the total Omani population of 1960, and interpolated to 1990. Information on the total population between 1950 and 2015 was obtained online from the Department of Economic and Social Affairs of the United Nations (2015) (https://esa.un.org/unpd/wpp/). For 1950, we assumed that the percentage of the coastal rural population from the total population was equivalent to 7%, i.e., equal to the percentage of coastal rural population obtained for 1960, as no major societal changes occurred during the 1950s. The percentage of the coastal rural population in 2010 from the total population is 2.44% (Table 5). We assumed that this percentage decreased slightly to 2% in 2015, and interpolated between 2010 and 2015. According to FAO (2014), the apparent per capita consumption of fish in Oman was estimated to be between 20 and 30 kg·year−1 during the 2008-2010 time period, which is much higher than in neighboring countries. Based on this, we assumed an annual per capita subsistence catch rate of 45 kg·year−1 in the 1950s, which decreased to 30 kg·year−1 in 1975, then to 10 kg·year−1 in 2015. Interpolations were applied between the different anchor points. These rates were then applied to the total coastal rural population. These assumptions were based on the fact that most other food sources and livelihood opportunities became available when the oil industry was launched. According to Kelleher (2005), the discard rate in Oman is about 1% of total landings. Discards of small-scale fisheries were obtained by applying this rate to the reconstructed total small-scale catches (reported and unreported). According to Morgan (2006), discards are not allowed in the industrial fishery, but occur occasionally. The discarded fish consist mainly of damaged, non-targeted, and/or undersized fish. We assumed that trawlers discarded the equivalent of 5% of their landings. Discards from the industrial sector were estimated only for trawlers. Longliners, which are more selective, are assumed to not have any discards. No data could be found on recreational catches in Oman. However, both local and tourism-based recreational fisheries exist. To regulate and monitor their activities, the government provides two types of licenses for people who wish to fish for leisure (www.oman.om): annual, and daily “non-professional” fishing licenses for recreational fishing using hooks and lines. Although the number of annual licenses is publically available, there is no information on the duration of the recreational fishing trips. To roughly estimate the number of domestic recreational fishers, we applied a recreational fishing participation rate of around 0.12%, estimated for Western Asia by Cisneros-Montemayor and Sumaila (2010), to the annual total Omani population. We then assumed that recreational fishing in Oman was non-existent in 1960 (i.e., zero in 1960) and increased to 5 kg·fisher−1·year−1 by 2010. We interpolated the catch rate between 1960 and 2010 and extrapolated it to 2015. Recreational catches were obtained by multiplying the estimated number of recreational domestic fishers by the annual recreational fishing catch rate for the 1960-2015 period. While tourism-based recreational fishing also exists, we did not estimate their recreational catches. Thus, overall, our recreational catch is likely an underestimate. The fishery in the Musandam Peninsula is solely small-scale. Reported landings in this region for the 1985-2015 time period were made publically available by the Fisheries Statistic Department of Oman (2010, 2012, 2016), suggesting that Musandam's contribution to the reported marine fisheries yield of Oman increased from 1.9% in 1985 to almost 8% of reported artisanal Omani catch in 2015. Landings for the years prior to 1985 were obtained by assuming that catches in that region were equivalent to 0.5% of the total Omani reported artisanal catches in 1950 and increased gradually to 1.9% in 1985. To estimate unreported artisanal landings and discards, we applied the same methods as used for the rest of Oman. Recreational and subsistence catches in Musandam were derived by applying the annual ratio between Musandam's and the total of Oman's commercial catches (e.g., in 1988 commercial catches by Musandam were 1.2% of Omani total catches) to the total subsistence and recreational catches. For instance, recreational and subsistence catches of Musandam were estimated to be 1.3% of respectively total recreational and subsistence catches of the whole of the country in 1988. The taxonomic breakdown of reported artisanal as well as industrial landings was available for the 2000-2015 time period in the “Fisheries Statistics Book” of the Fisheries Statistic Department of Oman (2010, 2012, 2016). For each of the small- and large-scale sectors, the proportions of each species or taxon group for the year 2000 were calculated and applied to the total artisanal catches for the 1950-1999 time period, and the total industrial catches for the 1980-1999 time period. The taxonomic disaggregation was made separately for trawlers and longliners. 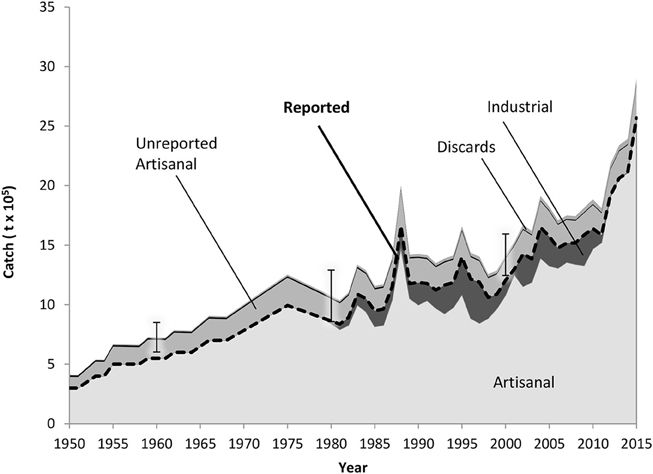 For the artisanal discards and the subsistence catches, we applied the estimated proportion of fish families caught by the artisanal fishery during the 1950-2015 time period. The same method was applied to the unreported artisanal catches, except that catches of spiny lobster were estimated separately. Finally, for the recreational fishery, we identified the most targeted families of fish by recreational fishers, in Oman according to Fishfishme Inc., i.e., one of the largest online platforms, allowing tourists to locate and book charter trips around the world (www.fishfishme.com). The percentage of each family targeted by this fishery was then estimated according to its assumed importance and popularity in the region (Table 2). Table 2. Taxonomic composition assumed to be caught in the recreational fishery. The taxonomic disaggregation of the artisanal sector for Musandam was made based on the “Fisheries Statistic Book” of the Fisheries Statistic Department of Oman (2010, 2012, 2016) and the work of Cornelius et al. (1973). The taxonomic disaggregation of discards, as well as unreported artisanal, recreational, and subsistence catches were completed similarly to the rest of the country. Subtractions were then applied between each taxonomic group of each sector in Musandam as well as the whole country in order to obtain the annual catches by taxonomic group by sector for the rest of the country separately. This catch reconstruction is based on assumptions and different information sources, some of which were mutually inconsistent. To evaluate the uncertainty of our reconstruction, we used the approach described in Zeller et al. (2015). This approach is based on criteria (Table 3) used by the Intergovernmental Panel on Climate Change to estimate uncertainty of information sources (Mastrandrea et al., 2010). Herein, the data and information sources used for reconstructing each sector are ranked with a quality score ranging from 1 to 4 (see Table 3) in each of three time periods (1950-1969, 1970-1989, and 1990-2015). Then, uncertainty ranges are computed, based on the catch weighed percent uncertainty in Table 3, which were scaled based on Monte-Carlo simulations in Ainsworth and Pitcher (2005) and Tesfamichael and Pitcher (2007). The Uncertainty scores assigned for each sector are represented in Table 4. Table 3. “Score” for evaluating the quality the catch reconstruction, with their confidence intervals (adapted from Mastrandrea et al., 2010). Table 4. “Score” assigned for each sector and period of time. Overall, total reconstructed domestic marine fisheries catches in the whole of Oman (i.e., Musandam plus the rest of the country, Figure 4; Appendix 5) increased from around 64,000 t·year−1 in the early 1950s (~48,000 t·year−1 reported in the 1950s according to FAO data) to around 92,000 t·year−1 in the 1960s (71,000 t·year−1 reported according to FAO data). During the 1970s to the 1990s, catches reached respectively around 127,000, 144,000, and 156,000 t·year−1. During the past 15 years, total marine fisheries catches more than doubled, increasing from around 142,000 t in 2000 to almost 290,000 t in 2015. Overall, the reconstructed total catch is 1.2 times the landings reported by the FAO on behalf of Oman for the period 1950-2015. Table 5. Anchor points for the rural Omani coastal population within 5 km from coast (CIESIN, 2012). Reconstructed total catches for the main part of Oman (excluding Musandam) are dominated by the artisanal sector, i.e., 90% of total catches are artisanal (Figure 2A; Appendix 1). Around 20% of the total artisanal catches are unreported. The industrial fishery rapidly gained importance in the 1990s, reaching a peak of 28% of total catches in 1997. Due to the ban on trawlers, by 2015, this fishery became almost non-existent (i.e., 0.08% of total catches, with only one active longliner). Subsistence and recreational catches are estimated to be 1% and < 0.01% of total catches, respectively. Discards contributed around 1.2% of the total catch. Figure 2. Reconstructed catches for Oman (excluding Musandam), 1950-2015, by (A) sector, with discards shown separately, and adjusted reported landings overlaid as a dashed line graph. Subsistence and recreational catches are included, but are too small to be visible; and (B) by main taxonomic group. “Others” includes 19 additional taxonomic groups. The main fish families caught by fishers in the main part of Oman, Figure 2B; Appendix 2, are the Clupeidae (~32%), which consist mostly of Indian oil sardine (Sardinella longiceps), followed by mackerels (Scombridae, ~19%), emperors (Lethrinidae, ~6%), jacks (Carangidae, 4.6%), and groupers (Serranidae, ~3.6%). Catches of separate area Musandam represented 3% of the reconstructed total catch for Oman. Reconstructed marine fisheries catches in Musandam consist of 98% small-scale catches, of which about 12% are unreported (Figure 3A; Appendix 3). Subsistence and recreational catches represent a negligible fraction of marine catches, i.e., ~0.7% and < 0.01%, respectively. Discards represent around 1% of the catch in Musandam. As illustrated by Figure 3B; Appendix 4, Scombridae are the most important taxonomic group (~38%), followed by anchovies (Engraulidae,~15%), and Carangidae (~14%). Lethrinidae, Clupeidae, and Serranidae make up around 4% each of total marine fisheries catches in Musansdam. Figure 3. Reconstructed catches for the Musandam Peninsula (Oman), 1950-2015, by (A) sectors shown separately and reported landings overlaid as a dashed line graph. Discards, subsistence and recreational catches are included, but are too small to be visible; and (B) by main taxonomic group. “Others” includes 17 additional taxonomic groups. The marine fisheries catch reconstruction for Oman for the period 1950-2015 combines the reported large- and small-scale commercial landings with our best estimates of unreported large- and small-scale commercial, recreational, and subsistence catches, as well as estimates of large- and small-scale discards. Some of these estimates are very uncertain (Table 5, Figure 4), but they likely represent, overall, a more accurate picture of the total catch than if these components were omitted (which is the unavoidable result of not reporting on existing, but unmonitored components). Figure 4. Reconstructed catches for all Oman (including Musandam), 1950-2015, by sector, with discards shown separately, and adjusted reported landings overlaid as a dashed line graph. Subsistence and recreational catches are included, but are too small to be visible. Uncertainty bars are displayed for the periods 1950-1969, 1970-1989, 1990-2015. Small-scale fisheries are very important in Oman, i.e., nearly 98% of total catches in 2015 are artisanal in nature. The industrial fishery, composed of trawlers and longliners, has been decreasing in importance over the past decade. For several reasons, including conflicts between artisanal and industrial fishers, the Omani authorities have banned trawling since 2011 (Fisheries Statistic Department of Oman, 2012; Alhabsi, 2013). Even before this measure, the Omani government invested greatly in controlling the activities of the industrial fishing sector through quotas, gears, temporal and fishing areas restrictions, the prohibition of discarding and the deployment of on-board governmental observers (Morgan, 2006). Since the 1970s, the fishing industry has been heavily subsidized and several initiatives were taken to improve fishery management, product quality and fisheries research (Morgan, 2006; Alhabsi et al., 2011). This includes the production of annual fisheries statistical reports that are much more detailed than those of neighboring countries (Fisheries Statistic Department of Oman, 2010, 2012, 2016). Nevertheless, the catch reconstruction for Oman shows that almost 20% of total marine fisheries catches, including discards are unreported. This result is based mostly on conservative assumptions, and thus may be higher. While it may be argued that 20% is low, especially compared with neighboring countries (Al-Abdulrazzak and Pauly, 2013), there is still a need for local studies to estimate the real incidence of the different unreported fishing activities in Omani waters. Recreational fishing has been growing exponentially in Oman, in parallel with the rapid development of the tourism sector in general1, i.e., number of arrivals increased by almost 50% between 2011 and 2014. A simple online search using key words such as “fishing in Oman” leads to numerous websites and online platforms that give very detailed fishing guides to foreign recreational fishers in Oman2, e.g., providing information on the best seasons, species, area, and gears for “a good fishing experience.” For instance, annual and daily licenses for sport fishing provided by the Omani authorities increased by a factor of 3 in the 2010-2015 time period, increasing from just over 1% of total fishing licenses in 2010 (including professional licenses) to 3% in 2015 (Fisheries Statistic Department of Oman, 2011, 2016). Recreational fishing is currently so common that conflicts between professional and recreational fishers are starting to emerge3. Subsistence fishing, although not as important as in the pre-oil period, still plays a role in the Omani society. Fishing has always been culturally and traditionally part of the lives of the Omani people. According to Maynard (1988), “the Omani coastal populations are traditional sea-faring people with the basic skills for a working life at sea.” Although, this might not be currently as prevalent as previously, Belwal et al. (2015) pointed out that families of fishers practice fishing without a license and that subsistence fishing does exist. Unreported artisanal catches are likely to be considerably higher than the findings of this study. Several commercial artisanal fisheries are not being monitored or even considered to be fisheries. The tribal, independent nature of coastal communities of fishers across Oman is what characterizes the traditional small-scale Omani fishery. Yet, this very same nature, combined with the large number of artisanal fishers, is what makes the management and the monitoring of the artisanal commercial fishery challenging for the Omani government (Al-Marshudi and Kotagama, 2006; Morgan, 2006; Qatan, 2010). Instead of adapting to the nature of its traditional fishery, the Omani government appears to have decided, perhaps based on its experience with the industrial fishery, to use a centralized top-down fisheries management approach, while allowing open access to poorly regulated artisanal fisheries (Morgan, 2006; Alhabsi, 2013). This is likely to lead to overcapacity problems in the future. As for the commercialization of catches, even when fishers are licensed, they do not necessarily sell their catches through the regulated channeled markets, and their catches are thus not monitored by the fisheries catch data collection system (Morgan, 2006), e.g., selling fish directly to consumers on the road, without passing through the fish markets4. One non-monitored small-scale commercial fishery is particularly interesting: the invertebrate fishery by Omani fisherwomen. These women have been part of the small-scale fishing industry in Oman for a long time, and mainly collect gastropods and bivalves from beaches as a source of income (Rashdi and McLean, 2014). Such under-valued and often ignored fisheries contributions by women are widespread around the world (Harper et al., 2013). Despite the efforts of the Omani government in limiting and even prohibiting discarding, this practice is likely to occur occasionally (Kwiatkowska et al., 2000; Morgan, 2006), as fishing operations need to be tightly monitored to suppress discarding entirely. Note that the FAO explicitly requires countries not to include discards as part of their annual fisheries catch reports (Pauly and Zeller, 2016). Oman is the first Arab state to ratify the 2009 FAO Port State Measures Agreement. Yet, illegal fishing has been occurring in the Omani EEZ. For instance, there used to be an export of spiny lobster and fish to other countries that is not reflected by the data recording system (Morgan, 2006). Several foreign countries used to fish in Omani waters and their catches have not been reported or monitored, e.g., Thailand used to fish on the coast of Oman during the 1970s (Pauly, 1996). In this catch reconstruction, this illegal fishing was not accounted for because of the scarcity of information. However, this warrants further historical research. A tentative stock assessment was performed for the Narrow-barred Spanish mackerel, known in Oman as Kingfish, (Scomberomorus commerson, McIlwain et al., 2005), but scarcity of data precludes other major exploited species from being assessed (Fouda et al., 2009). 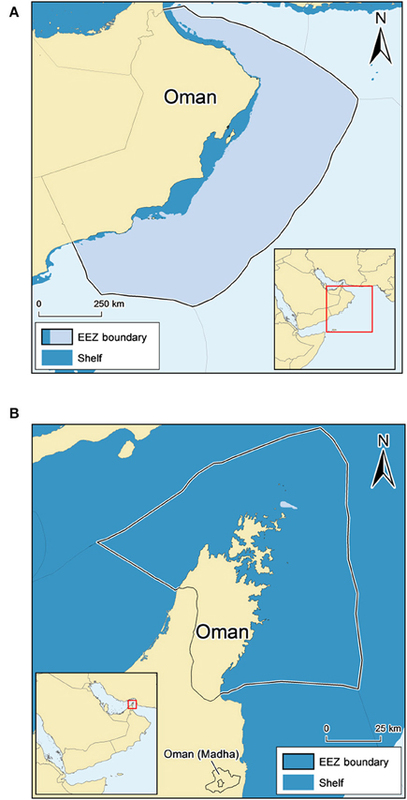 What little is known is consistent with the observation that “fishing down” occurs in Omani waters (Abd-El-Rahman, 2014), e.g., in Dhofar and Albatinah. As well, by comparing the reported artisanal marine fisheries catches of each province, we noticed that marine catches in the north (Musandam) and in the south (Sharqiyah, Dhofar, and Wusta) are increasing, while catches in the center (Muscat and Batinah) are decreasing (Figure 5). This may be a consequence of stronger declines in the central area, where major urban centers occur. Figure 5. The percentage of marine fisheries catch by Omani province, between 1985 and 2015; presented in this graph according to their geographic position, from Dhofar in the South to Musandam in the North. Compared with the cost of traditional stock assessments, catch-based indicators would represent a cheaper and less data-demanding method to assess the status of fisheries in Oman (Pauly et al., 2013). Such indicators, however, require accurate catch data, i.e., including the landings from all fisheries sectors, and their discards, if any. This study illustrates the need for continuously improving the data monitoring system for Oman, with emphasis on all fishing sectors and components. This cannot be done without the improvement of its fisheries related infrastructure such that it can address the need of rural coastal communities of artisanal and subsistence fishers, and also requires methods to be developed and applied for estimating recreational catches. Oman aims to rely on its marine living resources when its oil is depleted. It will be able to do this only if it ensures that its fish stocks do not meet the same fate as its oil, and sound management starts with best possible data. MK: Completed the data assembly and analysis, and drafted the article; KZ: Assisted in general catch reconstruction queries, and edited the manuscript; DZ: Advised on methodological approaches, guided analytical decisions, and contributed to the manuscript; DP: Guided the conceptualization of the study, reviewed and edited the manuscript, and presented the findings to the government of Oman. We acknowledge support from the Sea Around Us, a research initiative at the University of British Columbia, funded by the Paul G. Allen Family Foundation. More details on the reconstruction of marine fisheries catches for Oman as well as a previous document related to this work are available through the Oman EEZ page at the Sea Around Us website www.seaaroundus.org. 1. ^www.indexmundi.com/facts/oman/international-tourism (accessed on 25-06-2016). 2. ^www.gt-fishing-oman.com, www.fishfishme.com/blog/best-fishing-season-oman (accessed on 25-06-2016). 3. ^http://www.y-oman.com/2015/01/traditional-fishing-makes-waves (accessed on 25-06-2016). 4. ^www.y-oman.com/2015/01/traditional-fishing-makes-waves (accessed on 24/06/2016). Abd-El-Rahman, M. A. E.-B. (2014). A bio-economic study of the trophic structure of the Omani fish catch. Trop. Life Sci. Res. 25, 29–40. Al-Abdulrazzak, D., and Pauly, D. (2013). “From dhows to trawlers: a recent history of Fisheries in the Gulf countries, 1950 to 2010,” in Fisheries Centre Research Reports (Vancouver, BC: The University of British Columbia). Alhabsi, M. S. (2013). Involvement of fishermen in fisheries co-management in Oman. Greener J. Agric. Sci. 3, 341–354. Alhabsi, M. S., Malaysia, T. D. I., and Mustapha, N. H. N. (2011). Fisheries Sustainability in Oman. J. Econ. Sustain. Dev. 2, 35–48. Béné, C. (2006). Small-scale fisheries: assessing their contribution to rural livelihoods in developing countries. FAO Fish. Circ. 1008, 46. CIESIN (2012). National Aggregates of Geospatial Data Collection: Population, Landscape, and Climate Estimates, Version 3 (PLACE III). Available online at: http://sedac.ciesin.columbia.edu/data/set/nagdc-population-landscape-climate-estimates-v3 (Accessed June 6 2016). Department of Economic Social Affairs of the United Nations (2015). World Population Prospects: The 2015 Revision, DVD Edition [Online]. Available online at: http://esa.un.org/unpd/wpp/Download/Standard/Population/ (Accessed June 22 2016). FAO (2009). “Report of the FAO/RECOFI regional workshop to combat illegal, unreported and unregulated fishing Muscat, Oman, 30 March–2 April 2009,” in Fisheries and Aquaculture Report. (Rome: FAO). FAO (2014). La situation Mondiale des Peches et de L'aquaculture. Rome: FAO. Fisheries Statistic Department of Oman (2010). Fisheries Statistics Book 2009. Muscat: General Directorate of Fisheries Research. Fisheries Statistic Department of Oman (2011). Fisheries Statistics Book 2010. Muscat: General Directorate of Fisheries Research. Fisheries Statistic Department of Oman (2012). Fisheries Statistics Book 2011. Muscat: General Directorate of Fisheries Research. Fisheries Statistic Department of Oman (2016). Fisheries Statistics Book 2015. Muscat: General Directorate of Planning and Development. Kelleher, K. (2005). Discards in the World's Marine Fisheries. An Update. Rome: FAO, Fisheries Technical Paper 470. Kwiatkowska, B., Dotinga, H., and te Utrecht. Netherlands Institute for the Law of the Sea, R. (2000). International Organizations and the Law of the Sea: Documentary Yearbook. Vol. 1 (1985). Utrecht: Springer. Mastrandrea, M. D., Field, C. B., Stocker, T. F., Edenhofer, O., Ebi, K. L., Frame, D. J., et al. (2010). Guidance Note for Lead Authors of the IPCC Fifth Assessment Report on Consistent Treatment of Uncertainties. Busan: Intergovernmental Panel on Climate Change (IPCC). Maynard, J. A. (1988). Commercial Fisheries in Oman. Bureau for Private Enterprise, U.S. Agency for International Development, The Ontani-American Joint Commission for Economic and Technical Cooperation. Metz, H. C. (1993). Persian Gulf States: A Country Study, ed U.S.D.o.t. Army. Washington, DC: Federal Research Division of the Library of Congress. Morgan, G. (2006). “Country review: Oman,” in Review of the State of World Marine Capture Fisheries Management: Indian Ocean, ed C. D. Young (Rome: FAO), 269–280. Pauly, D. (1996). “Fleet-operational, economic and cultural determinants of by-catch uses in Southeast Asia,” in Solving By-Catch: Considerations for Today and Tomorrow, ed Anon (Fairbanks: University of Alaska, Sea Grant College Program), 285–288. Qatan, S. (2010). Operating a Wholesale Fish Market in the Sultanate of Oman Analyses of External Factors. Iceland: UNU-Fisheries Training Programme. Rashdi, K., and McLean, E. (2014). Contribution of small-scale fisheries to the livelihoods of Omani women: a case study of the Al Wusta Governorate. Asian Fish. Sci. Spec. Issue 27S, 135–149. Riphenburg, C. J. (1998). Oman: Political Development in a Changing World. London: Praeger Publishers. Strømme, T. (1986). Pelagic and demersal fish resources of Oman: results of the R/V Dr. Fridtjof Nansen in Oman 1983-84. Reports on Surveys with the R/V Dr. Fridtjof Nansen. GLO/82/001. UNDP/FAO Progamme, 54 + Annexes. Vincent, P. (2008). Saudi Arabia: An Environmental Overview. CRC Press. Zeller, D., Booth, S., Davis, G., and Pauly, D. (2007). Re-estimation of small-scale fishery catches for U.S. flag-associated island areas in the western Pacific: the last 50 years. Fish. Bull. 105, 266–277. Copyright © 2016 Khalfallah, Zylich, Zeller and Pauly. This is an open-access article distributed under the terms of the Creative Commons Attribution License (CC BY). The use, distribution or reproduction in other forums is permitted, provided the original author(s) or licensor are credited and that the original publication in this journal is cited, in accordance with accepted academic practice. No use, distribution or reproduction is permitted which does not comply with these terms.